My father, Richard H. Stambaugh, 89, got his only visit to the World War II Memorial in Washington, D.C. courtesy of Honor Flight. As part of a review of the first decade of the 21st century, this picture appeared on the front page of nytimes.com on Dec. 24, 2009, three days after Dad had died. In August, I emotionally crashed and burned. I thought I had been dealing pretty well with my father’s death late last year. Truth is, I wasn’t dealing with it at all. Like so many others who have lost loved ones, I kept myself busy, and suppressed any emotions and hurts that spontaneously tried to ooze out at serendipitous times. I denied my suffering perhaps afraid to let myself go. I needed to properly mourn, take care of myself and share with others just how much Dad meant to me. I thought I had of course. But I was just fooling myself. I know now that what happened to me was inevitable. I was in denial and the resulting consequences finally had caught up to me. I thought I was alone in this internal battle, and had to be strong for our mother and myself. In his final months and days, Dad had received marvelous care from Hospice of Holmes County, along with the staff at Walnut Hills, the assisted living facility in Walnut Creek, Ohio where he and Mom lived. After his death, I began receiving monthly mailings from Hospice. Most of them had articles and literature on grieving. Thinking that I was doing just fine, I usually glanced at them and that was it. That information was for others, not me. I was wrong. The day my emotions hit rock bottom another Hospice mailing arrived. In it was an invitation to attend a special five-week session on grieving. I wasn’t tolerating the depression medicine the doctor had prescribed for me. I decided to stop the meds and start the counseling. The group was small, which allowed for intimate, personal, confidential sharing. We met once a week for five consecutive Thursdays. I knew most of the handful of people who attended. The lives of rural people tend to intertwine consequentially. 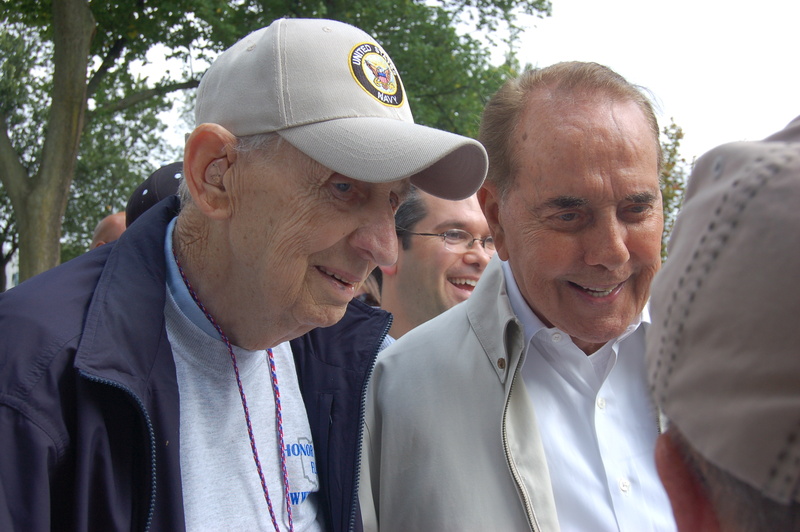 Seeing Bob Dole, who was instrumental in making the World War II Memorial a reality, seemed to energize my father. Dole is often at the memorial to greet Honor Flight veterens. Participants made the two hours each week a priority. We laughed, cried, listened and comforted each other. Our common, profound grief, our tears and smiles bonded us together with measureless compassion. By the end of the final session, I had a greater appreciation for what others go through, how much people hurt even years after losing a loved one. I was no exception. I learned, though, that hearing the varying situations of others helped see my own issues in a new and realistic perspective. We learned that grieving is an ongoing process. It takes time and understanding. Still, I saw healing in my fellow mourners, and I felt healing myself. The last night we met, each of us took turns sharing something significant about our loved ones. Pictures, quilts, special mementos were all passed around. I showed a slideshow of the Honor Flight trip I took with my father and older brother to Washington, D.C. in September 2009. 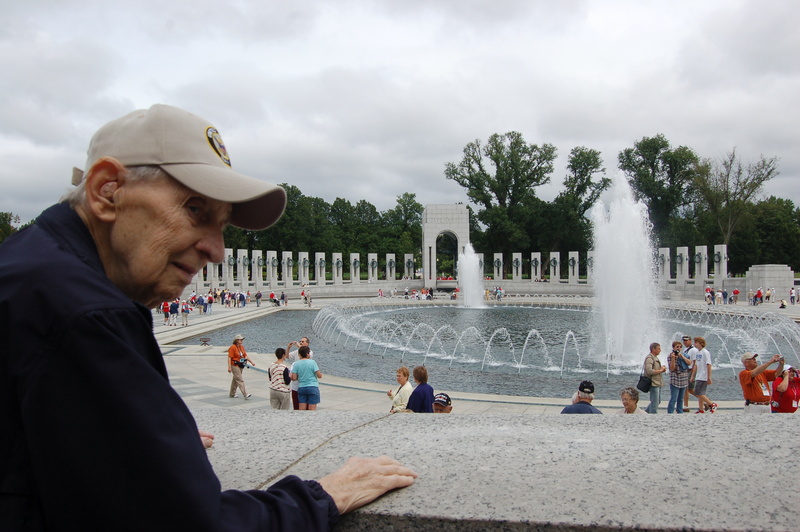 Honor Flight is a program begun a few years ago to transport as many World War II vets as possible to the memorial in their honor in the nation’s capital. I served as Dad’s guardian for the day, wheeling him around in his wheelchair. My older brother assisted two more able bodied vets. When asked where that experience fit in his 89 years of living, Dad said it ranked right after his marriage. Knowing how much the trip meant to Dad, my brother and I were blessed to have been a part of that marvelous experience. In the same way, I was honored to have participated in the bereavement small group. The unconditional love and acceptance I experienced were unforgettable and priceless. The hugs and handshakes upon parting told me the feelings were mutual. 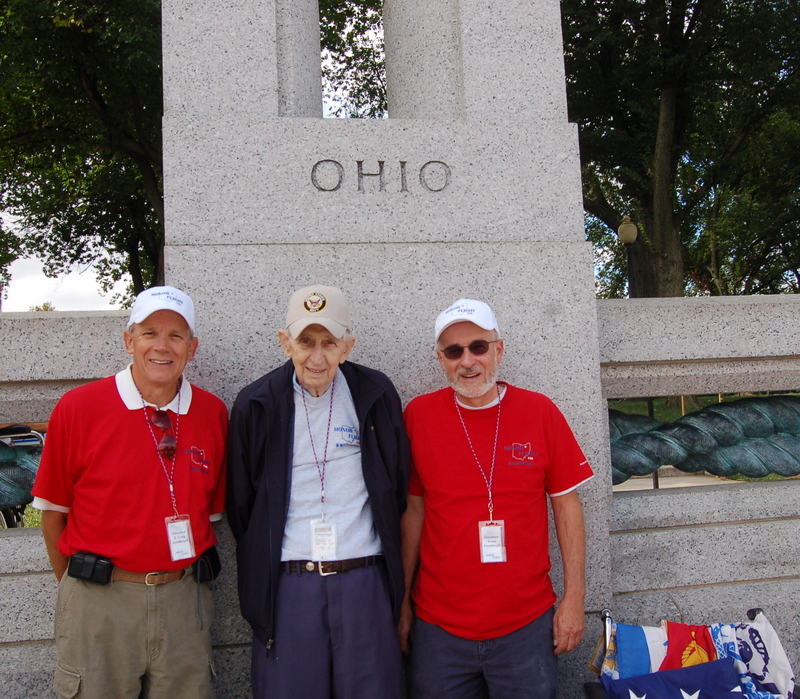 My older brother, Craig, Dad and I posed for a picture at the Ohio pillar at the World War II Memorial in Washington, D.C. on Sept. 12, 2009.